Push-Pull LC Duplex Fiber Optic Patch Cords containing the custom push-pull strain relief boot and duplex clip, allow users easy accessibility in tight areas when deploying very high density LC patch fields in data center applications. 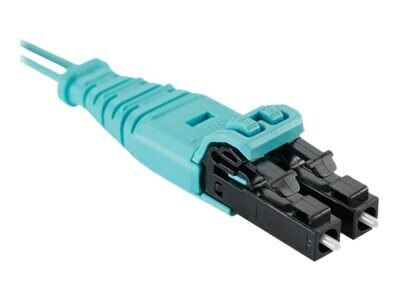 Push-Pull LC Duplex Fiber Optic Patch Cords meet the demands of Gigabit Ethernet, 10 Gigabit Ethernet and high speed Fiber Channel. Provide interconnect and cross-connect of applications in entrance facilities, telecommunication rooms, data centers, at the desk and network applications to interconnect pre-terminated cassettes in main distribution, horizontal distribution, and equipment distribution areas.